Two charts caught my eye this week. I swiped this one from Andrew Sullivan. The Washington Post's website is dipping, while HuffPost is slowly increasing in popularity. Wowsies. Even though JT scorns the colors, this chart is also awesome. It was swiped from Steve Benen. Why is the South so different from the rest of the nation? Is it part of the legacy of slavery? Number of Baptists? Guns? 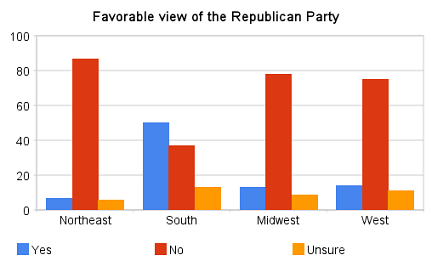 As a Southern native, my thoughts are that the south is more socially conservative than anything. They are fearful and shun anyone different from themselves (themselves being defined as white and male mostly). And the politicians play to these fears and so people like them for it. There are huge numbers of poor of all stripes (white, black and hispanic) for whom the democrats are a better party, but they are largely left out of polls, voting, etc. Also, the South lacks larger urban areas–there’s no New York or Chicago or Seattle to offset the isolated rural areas. Atlanta is as close as one gets and it’s more suburban sprawl than anything else, though I think within a decade, it will look more like Chicago or Philadelphia than it currently does. Another factor. Education. I’m having a hard time finding recent data, but the southern states tend to rank low no matter how you measure outcomes and they also tend to spend less per student. That leaves you with a lot of people who may not have the kinds of critical thinking skills that would encourage them to examine the political scene more thoughtfully. It’s probably way more complicated than that. I can say, though, after having grown up there and then lived there off and on until about 8 years ago that there are odd pockets of serious conservatism and then odd pockets of real liberalism (in college towns and larger cities) with a lot of moderates in between. It’s a complex place. As a good Southern girl myself, I want to confirm the complexity of the South as well. This is the land of William Faulkner, grits, wondrous sweetened iced tea, Truman Capote and Julia Roberts. Clearly they’e (we?) doing something right amidst all it seems they’re (we?) doing wrong. About the media chart–it looks more to me like the Huffington Post had a good run during the election and is now experiencing a plateau with a possible downward trend. We’ve been in Texas two years and I have my doubts. For one thing, I see more mixed-race (black/white, white/Hispanic) families here than I have ever seen anywhere, having lived in rural Washington, LA, Pittsburgh, suburban MD, and DC. I don’t know why, exactly, but I suspect it’s because (at least in our area) poor folk of all colors live in close range of each other and have a large cultural affinity (diet, religion, etc.). I’m not saying that they all necessarily love each other (Serbs and Croats have a lot in common culturally, too), but there’s something there that doesn’t exist up North. Texas also has an extremely powerful regional identity (it’s sometimes difficult to remember that it belongs to a larger entity called the United States) that may make it rather different than other areas of the South. For years it’s seemed that making fun of Southerners was the only “ethnic joke” that remained acceptable in my circle of friends. Now I’m seeing there’s actually something to it — not that the jokes are accurate, but that the South really is a markedly different place. Why is the South so different? There are lots and lots of answers, but any answer that leaves out “because it was an occupied territory/colony for over 100 years” is a bad answer. I feel that the great book about the South has yet to be written. Something that takes in the great and the awful. One of my old favorites was Southern Politics (V.O. Key), but I’m not sure it holds up anymore. I’m entirely fascinated and ignorant about these matters, so I would eagerly lap up a great book on this topic. It all starts with the War of Northern Aggression. Occupied territory for over 100 years? If I remember my Civil War-era history, the South was occupied until 1877, at which point it was “redeemed” and the white folks took back all the statehouses. This was the beginning of poll taxes, grandfathering in, etc. SamChevre, I would be interested to hear your take on the whole occupation thing after that point. Also, it’s been probably 10 years since I read the Promise of the New South, but in that book there was much discussion of how backward the South was *before* the war (underserved by rail lines and other infrastructure, relatively undereducated, isolated, etc) and how much it took to overcome those factors. Even in the 1930s the South was playing catch-up on such things. I would argue these systemic issues are a bigger deal than Reconstruction. One could even argue that the war and Reconstruction are both symptoms of this overall backwardness. BTW Laura any chance of doing a post on the summit in Pittsburgh? Just so we can get some good snark from MH? Sure. MH needs his candy. Just so long as nobody wants any actual information. After seeing all of the police around Pitt yesterday, I decided that I really needed to go to my other, very remote, office today. And Friday seems like a good day to take care of the garage before winter sets in. VO Key is great, but his field work is coming up on, what, its 70th anniversary? Even in the South that’s a fair piece of time. Key was out of print when I took Southern Politics at The University of the South, so we made do with reserve copies and an attempt at a follow-on book by Earl and Merle Black. (On checking, I see that it’s called Politics and Society in the South.) It was serviceable, as I recall. I’d be interested in more modern takes on the politics of the South, if anyone has more suggestions. I’ll also put forth a candidate for one of, if not necessarily the great book on the post-WWII South: Parting the Waters, by Taylor Branch. The story of the South in the modern era is the story of its black citizens’ rise toward equality. There are subsidiary stories of the political reaction to that rise and of overall demographic changes that may have made the South more like the rest of the nation. ML King is key to that great story, but Branch subtitles his biography of MLK “America in the King Years,” and it’s clear that he’s aiming for much more than just a biography of one man. Indeed, he opens by placing King within a tradition of black preachers and explains quite a bit about the black churches within America. The detail, the drama and the insights make it a great book. As to why the South is so different, David Hackett Fischer takes a stab at answering this question, albeit indirectly, in Albion’s Seed. His thesis is that that the foundations of American culture were laid by four distinct migrations from Britain that brought people from specific parts of the colonial power to the New World during particular periods and planted them, generally speaking, in separate areas. These four are, roughly, Puritans, Cavaliers, Friends and Borderers. Once planted, these distinct cultural groupings and worldviews propagated themselves geographically and temporally. The South is a mix of Borderer and Cavalier. (A few regions, such as Florida, Louisiana and Texas have cultures strongly influenced by other colonial legacies, but that’s largely after the period that Fischer writes about.) It’s an interesting thesis, one that would have been very interesting to follow in the planned additional volumes that were referenced in the notes to Albion’s Seed. Alas, none have ever appeared. Fischer’s argument is also a way of explaining why the American South wound up the way it did in comparison with other slaveholding cultures. Oh yeah, I’ve got to read Albion’s Seed. Steve and my dad loved it. We lived in the South for ten years–Virginia, Mississippi, and then Arkansas. The only part of that sojourn we didn’t like was the year in Mississippi; all the rest of it was mostly good. (More here.) I will say that in our experience, the stereotype that friendships and strong religious feelings go hand in hand in the South has a lot of truth to it, and that the folks who find the South unfriendly or close-minded are generally people so close-minded themselves that they just can’t handle any kind of God-talk. I second both of Doug’s recommendations. Branch’s Parting the Waters is a masterpiece, a fascinating synthesis of political, intellectual, and cultural history, all for the sake of putting King and the civil rights movement in their context. Branch’s other two volumes, going through the end of Kind’s life, are also very good, but Parting the Waters (which goes from 1954 to 1963) is the must-read. I’m not a huge fan of Albion’s Seed, but Hacket’s research is just so fascinating and detailed that I’m not bothered by how overwright (I think) some of his conclusions are. I use his Puritan/Cavalier/Quaker/Scots-Irish model to explain early American settlement patterns at least twice a year, in every American government and American political thought class I teach. I did a Premature Evaluation of the Fischer book for Fistful. You’d probably get through it faster than you think, Laura, even though it’s 800 pages of non-fiction. He’s got four groups and fifteen aspects of each, so the sections tend to go by quickly. Russell, it sounds like you’d also have liked the later volumes to have appeared to see how well the argument of the first holds up for later periods. I’d agree with you that it’s stretching a great deal — in the absence of additional evidence — to say that Puritan patterns determine things 350+ years later, but it’s certainly interesting. Other recommendations for theories of how the South got that way? Doesn’t the second chart look a bit like the other three regions are giving the finger to the South?